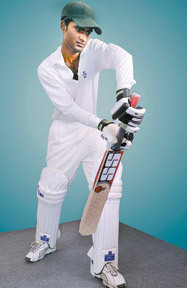 Milan Abeysekera of Royal College – the Most Popular Schoolboy Cricketer in Platinum Grade. 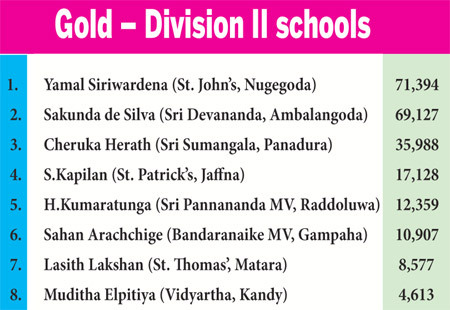 Yamal Siriwardena – Most Popular Schoolboy Cricketer in Gold Grade from St. John’s Nugegoda. 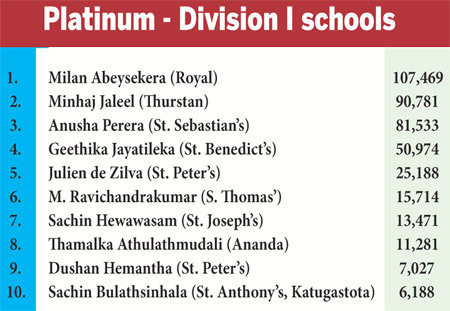 From the beginning of the contest it was quite clear that the fight for the first place in the ‘Platinum’ Contest for schools playing in the SLSCA division 1 tournament was between Royal’s Milan Abeysekera and Thurstan’s Minhaj Jaleel who was placed second with a majority of 16,688 votes. In the final analysis Abeysekera polled in 107, 469 votes to Jaleel’s 90,781 to emerge winner after a close contest. Abeysekera, a fourth year coloursman for Royal, was energetic behind the stumps besides his aggressive approach while batting. The lanky left-hander struck two useful innings in the last Royal-Thomian match and stamped his class to enter the ‘Battle of The Blues’ record books. He played in his last year and will no doubt be an asset to his club SSC while playing in the domestic circuit. 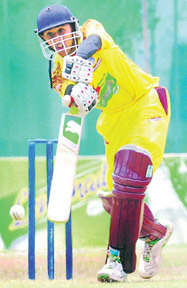 Ishara Hewage – Most Popular Schoolboy Cricketer – Silver Grade from Sri Rahula, Katugastota. In the ‘Gold’ Contest St.John’s Nugegoda’s skipper Yamal Siriwardena took the top berth with 71,394 votes over his closest rival Sri Devananda ,Ambalangoda’s Sakunda de Silva who polled in 69,127 votes. Siriwardena was placed first with a majority of 2,267 votes over De Silva. 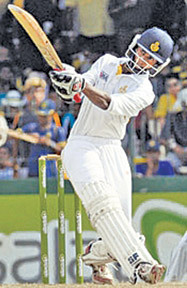 Siriwardena is an all-rounder who bowls medium pace and a front line batsman. He has topped the 1000-run mark this season and has taken over 25 wickets and represents the Wattala Antonians in the domestic Under 23 cricket tournament. Ishara Rangana Hewage of Sri Rahula College, Katugastota, may be the first player to be recognised in a competition of this nature. 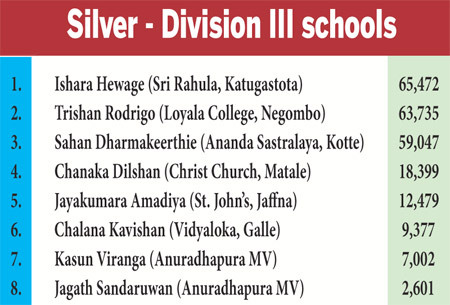 He was the popular choice in the Silver Contest for schools playing in the division three of the SLSCA cricket tournament. He had a lot of support from his home town fans in Kandy to have a final vote tally of 65,472 against Trishan Rodrigo of Loyala College ,Negombo who finished second with 63, 735 votes. Hewage won with a majority of 1737 votes. Hewage is a good prospect for the future, hailing from the Hill Capital. He is tipped to lead his school Sri Rahula, Katugastota in the coming 2013/2014 school cricket season. Hewage is a right hand top order attacking batsman with a big appetite for scoring runs. Last season he was dismissed in his nervous nineteens on three occasions , but he struck a fluent 188 which stands as the highest individual score for his school in a cricket match. He has scored over 500 runs in six matches. This year’s contest was a beginning of a new format of the competition with three segments, namely Platinum for schools playing in the SLSCA division 1 tournament, Gold and Silver for schools playing in the SLSCA division 11 and 111 tournaments. With the new system more players have been rewarded and more players from the rural schools will get the opportunity to establish themselves and play in the big league.